The subject of the application is simple examination tool. User can configure answers to questions 'Administrate answers' and then 'Take an exam'. 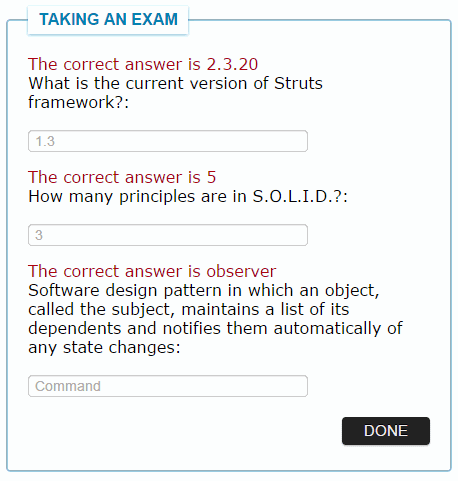 - exam-web - web application based on Struts 2 framework (whole configured with Conventions Plugin), also deployed separately as war. Application has been implemented using Struts2 MVC framework . I configured actions with annotations solely (dependency on Struts 2 Conventions Plugin). I also followed Post-Redirect-Get web design pattern. To review or clone an example please visit my exam GitHub repository. Instructions of building and deploying are attached in README file. I've deployed ear and war artifacts on RedHat OpenShift (examstarter application).